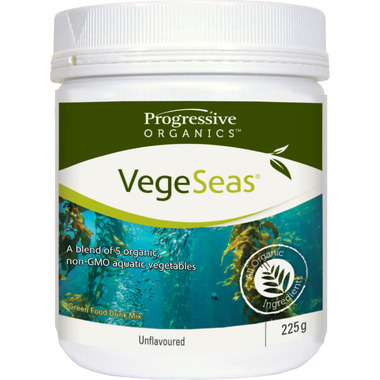 Progressive Organics Aquatic Greens VegeSeas is a source of iodine, chlorophyll and bioavailable iron. It assists in the detoxification process and supports energy production and mental alertness. It also promotes healthy hair, skin and nails and helps to fight inflammation. Suggested Use: One scoop of VegeSeas unto fruit juice or the beverage of your choice. May be consumed at any time of day. Start with a half serving and slowly increase to a full serving as desired. Ingredients: Organic spirulina, Organic wakame, Organic kombu, Organic Organic dulse, Organic nori.